Anaximenes (c. 585 – 528 BCE) is the third person in a series of philosophers from the Ionian city of Miletus. Thought to have been a student of Anaximander (610 – 546 BCE), Anaximenes has sometimes been treated rather harshly by reviewers of the Ionian enlightenment. 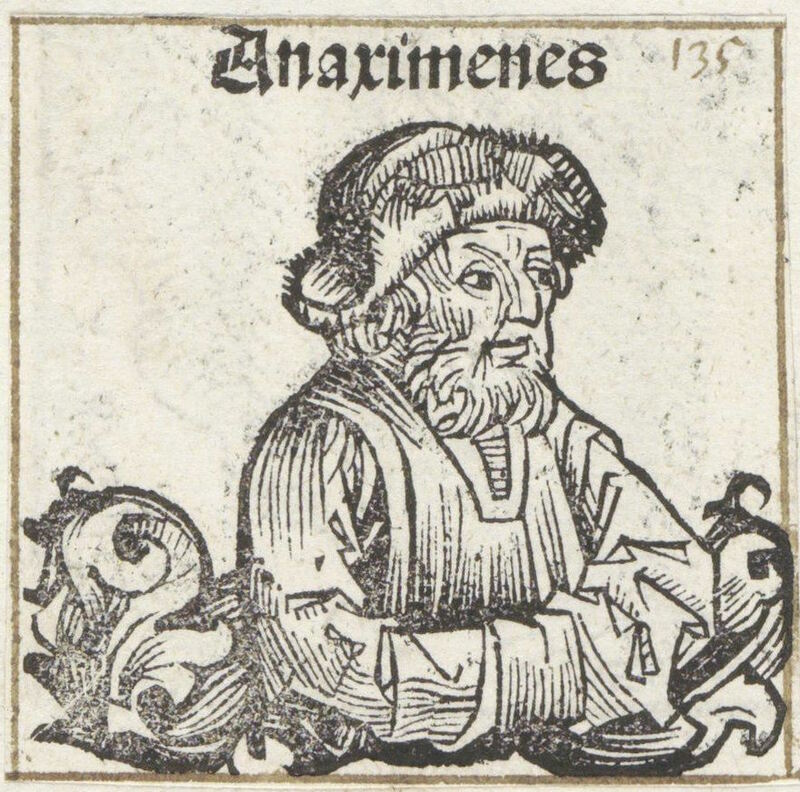 Anaximenes, woodcut image by Michel Wolgemut. To begin with, all of the Ionian thinkers traditionally have been collectively known as the “Pre-Socratics,” as if to imply that their main achievement was to pave the way for Socrates (c.470 – 399 BCE). Though more famous than the Ionians, despite the fact that he left not a fragment of writing, Socrates is not relevant to our discussion of the origins of science — except possibly in a negative way, as he is generally credited with moving Greek philosophy away from scientific matters. Anaximenes also backed off from Anaximander’s concept of the Apeiron, a boundless unseen force theorized as the origin of all matter, opting instead for a concrete, familiar substance. Whereas Thales thought that the essence of all things was water, Anaximenes thought it was air. Viewing the Apeiron as a forerunner to the ideas that Plato and later philosophers would embrace, some have considered Anaximenes idea about air to be a throwback to what they consider more primitive philosophy. But from the perspective of the development of science, a strong case can be made that Anaximenes ideas about air represented an advancement over the concepts of both of his predecessors. Unlike Thales, who, as far as we know, didn’t explain how water produced everything that exists, or Anaximander, who could not define his Apeiron in any way that could make it subject to scientific investigation, Anaximenes had ideas about the air that were entirely physical. He proposed that the air could produce all types of different substances — hot, cold, wet, dry, solid, gaseous — through condensation, rarefaction, and other processes associated with changes in density. He did not attribute some creative or animating quality to the air. In a sense, he backed away from the idea of the earlier Ionians, that matter contained some kind of mystical vitality that made it do things, known as hylozoism. Much more so than Anaximander and Thales, Anaximenes was a pure materialist, moving philosophy towards how nature operated and away from mystical realms. Being interested particularly in the air, Anaximenes hypothesized on the mechanisms underlying atmospheric phenomena. Like Anaximander, he wondered about thunder and lightning, but his proposed mechanism involved the wind (moving air) causing clouds to break up. 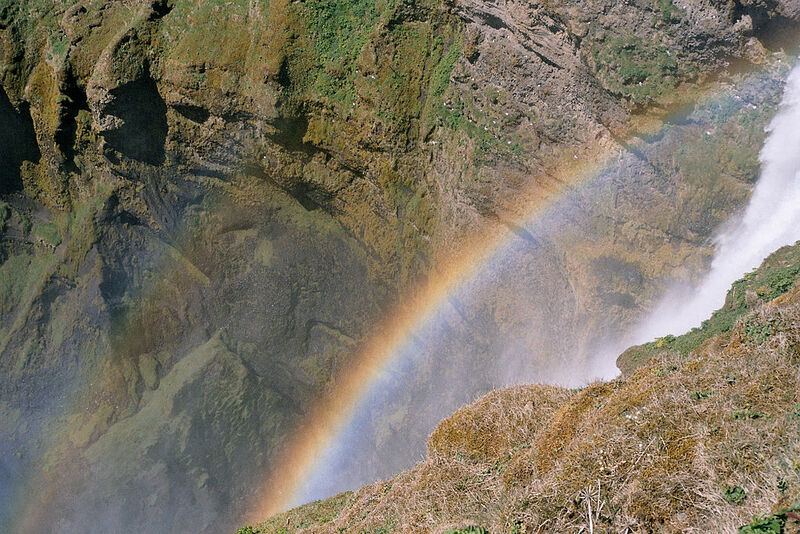 He also thought that rainbows resulted from the air condensing to a higher density and then being illuminated by sunlight. Whereas Anaximander envisioned the Earth floating in the Apeiron, Anaximenes thought that the Earth floated on air. In a sense, this was an advance too, because it meant that the same substance present at ground and sea level — the air — extended upward to the realm of the sun, moon, planets, and stars. This theory implied that the heavens were made of the same kinds of material that comprised the places where humans existed on Earth. And speaking of the planets and stars, Anaximenes was first among the Greeks to distinguish the planets as being something different than stars. Prior to him, planets and stars were considered to be basically the same, even if a few of them appeared to travel through the heavens in a very different manner from all the rest.